Hi Punters! It’s been a while. 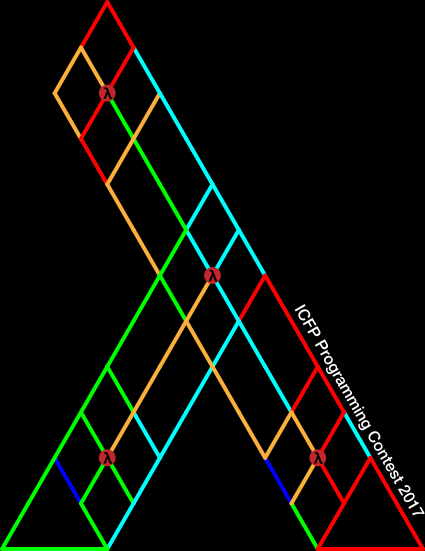 Following the success of the T-Shirts last year, Shuhei Takahashi has kindly designed a new ICFP Programming Contest inspired by our Lambda Map! None of us profit off these T-Shirts; they are here purely to serve as a memento. You can also print your own T-Shirt if you like, using the PDF here. 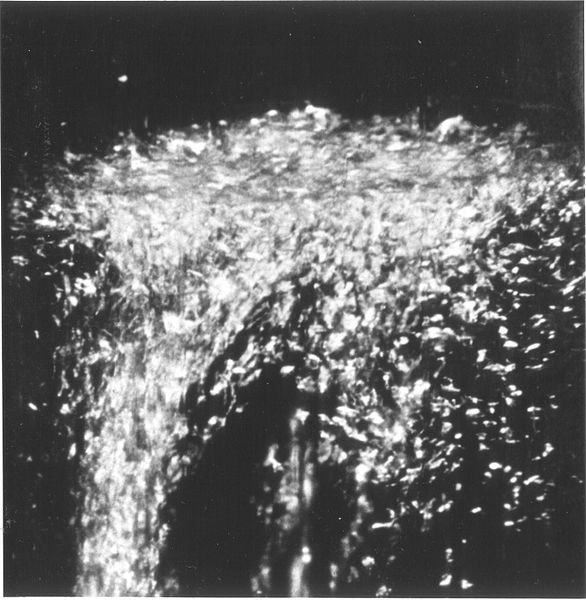 The image has been released under CC-BY 4.0. Note that it contains white text, so is unsuitable for inkjet printing. The design works best on a black T-Shirt. Finally, please do make sure you check the size chart when choosing the size, as the online retailers do vary! Thanks Shuhei – and we hope you enjoy the T-Shirts! The source code for the lambda punter server is now available here. The results of the second round of the full contest are now available. You can watch the replays of all the games on PuntTV. A total of 60 teams took part in the second round. The following maps were used with a selection of extension combinations always including futures. For each of the 6 map and extension combinations, we assigned groups of 16 teams (each group playing 16 times in order to allow every team to play in every position). The median number of points is 50. Any team with fewer points is now eliminated. The results of round 3, including the winners, will be announced at ICFP on Tuesday. A number of teams have asked for more details on why their punters have been failing. In some cases this has helped them to identify small patches to make them work with our test framework. Examples of such patches include the word “Maybe” and the line “fflush(stdout);”. Some teams have asked if we can try out their patched punters. If you can provide us with a small patch and build instructions that we can follow easily then we will be happy to run your patched punters in a special round in which we will also pit them against the eventual winners of the full contest. As we are quite busy just now, the actual evaluation may happen after the ICFP conference. The results of the first round of the full contest are now available. Their were 146 entries in total. You can watch the replays of all the games on PuntTV. Get Counterstrike and Race for the Galaxy at http://store.steampowered.com/! The most common problem seems to be that the protocol is not implemented correctly — resulting in some kind of exception being raised. Several entries fail to include the message size in their messages. There are various problems with managing the serialised game state. Some entries expect the server to send JSON state in the setup message matching a schema that is only defined by their clients. Another problem is relying on a particular order for fields of JSON objects that did not match the one of our testing framework. Some entries rely on writing state to the file system (explicitly disallowed by the specification). At least one entry always attempts to make illegal moves. A total of 120 teams took part in the first round. We used the same methodology as for the first round of the lightning contest, but with one fewer map (we only used one of the randomly generated maps compared with two in the first round of the lightning contest). For each of the 8 possible combinations of extensions and each of the 4 maps we assigned groups of 4 teams (each group playing 4 times in order to allow every team to play in every position). This gave rise to a total of 3840 games. The median number of points is 81.5. Any team with fewer points is now eliminated. We did not manage to download the DrunkAlexSh full submission because it was not properly shared with icfpcontest2017@gmail.com, so their entry is the same as the one used for the lightning contest. We do not know whether this failure has anything to do with their state of inebriation at the time. A number of other submissions had similar problems, but we think we managed to resolve them all. At least one team deliberately resubmitted their lightning entry to the full contest (which we have no problem with). We have now run the first elimination round for the lightning contest. There were 80 entries in total. You can now watch replays of all the test games on PuntTV. As a preprocessing step we removed all entries that were incapable of scoring anything at all on our simplest test map: lambda.json, even if they moved first. Some teams did not implement the handshake. Given that it was not present in the original (slightly buggy) version of the spec, we wrote a small wrapper that still enabled those teams to compete. The following 28 teams were unable to score anything on the lambda map. They are now eliminated from the lightning round. One team (cashto) was able to score on the lambda map when futures are disabled but not when enabled. Another team (negainoido) was able to score on the lambda map when futures were enabled but not when disabled. For the first round we used five small maps (with between 60 and 187 rivers) both with and without futures enabled. Every game was played with 4 teams. For each map a random assignment was performed and for each group of four players, four games were played on that map (in order to allow each player to start first, second, third, and fourth). Thus each team (with the exception of cashto and negainoido) played a total of 40 games. For each group, the sum of the scores for each player in that group over the four games was calculated in order to obtain a ranking. Points were then awarded based on the ranking (1st: 4 points, 2nd: 3 points, 3rd: 2 points, 4th: 1 point). The total number of points for each team was calculated by taking the sum of the points for each group they played in. So the maximum possible number of points was 40 and the minimum number was 10 (with the exception of cashto and negainoido, who only played in five groups each). The median number of points is 25.5. Any team with a points total below 25.5 is now eliminated from the lightning contest. Interestingly, there is not a direct correlation between aggregate score and aggregate points. For instance, the team with the highest aggregate score (fixstars) is the team with the 8th highest aggregate points. Team shinh11 deserves special mention for being the biggest (and worst) gamblers. It is time to hop off the punt and go ashore. The contest ended a little over an hour ago. 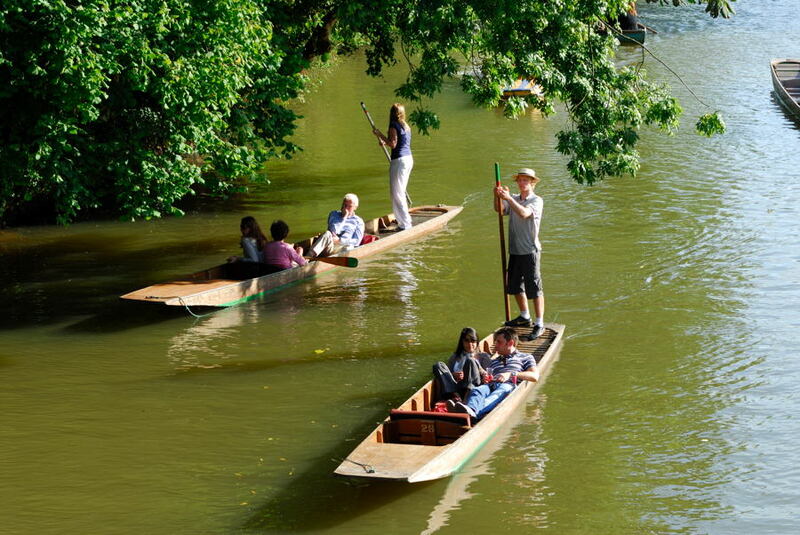 We would like to thank all contestants for punting with us. 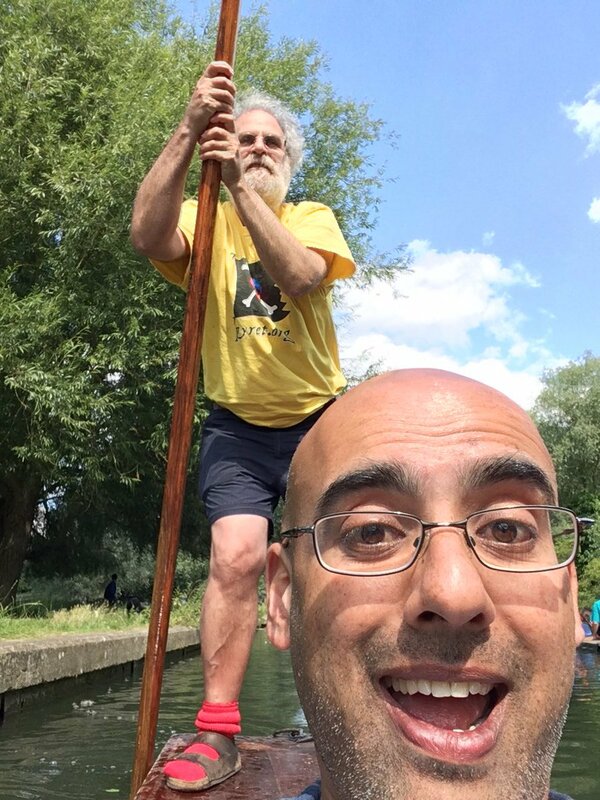 We hope you enjoyed punting on the ICFP contest rivers. Please make sure your latest submission is accessible by us, e.g. visit the Google Drive shareable link in incognito mode. Quite a few contestants have told us that they forgot to type their shareable link along with the MD5 checksum into the submission system. In case you find yourself in this situation then you can still register your submission via the submission system. Note: We only accept this submission if the timestamp on your Google Drive submission is prior to the official submission deadline. We will post further information regarding the evaluation of submissions in the coming weeks. Stay tuned! Yet again, thank you punting with us! Hello again punters! We hope you are enjoying the last part of the contest. The contest will be ending in three hours time. Please remember to share your entries with icfpcontest2017@gmail.com on Google Drive and to register here. Tony Hoare refers to null pointers as his billion-dollar mistake. Option types, popularised by functional programming languages, provide a much cleaner alternative. This extension has nothing whatsoever to do with null pointers or option types! This extension enables options, which allow a punter to use a river claimed by another punter. Every punter is allowed to buy n options during the game where n is the number of mines. Each river claimed by a punter has exactly one option which might be bought by a second punter. The rules for scoring are unaffected – but sharing a route with another punter might be a good option from time to time. You can find the specification here. Happy punting, and good luck! Is Listlessness Better than Laziness? Hello again punters! We hope you are enjoying the contest. In 1984, Philip Wadler posited that listlessness is better than laziness. We would like you to help us investigate this claim! This extension enables splurges, which allow a punter to be lazy (pass!) for n turns, and then claim a list of n + 1 contiguous rivers at once. The rules for scoring are unaffected — but being lazy may improve your chances of building a good route! Earlier, we also updated Lambda Duct to version 0.3. Lambda Duct allows you to test your offline mode by relaying your moves to the game servers. The major change from v0.2 is that v0.3 uses blocking I/O instead of non-blocking I/O. Good luck, and happy punting! We have released the initial version of Lambda Duct – an offline mode simulator for Lambda Punter. Lambda Duct acts as a bridge between a client in offline mode and an online game server. Please refer to the Lambda Duct repository on GitHub for instructions on how to install and use it. Note the ./ in front of the client program name. The Futures specification is here. We also made modifications to the problem description bumping it to version 1.3. Fixed typo in the type of the contents of the “timeout” message: Float rather than GameState. Clarified which moves are sent along with a stop message. Clarified that the size header in a message is a string. Clarified that the VM will be used for the evaluation. We updated the task description to version 1.2. Biggest change is an update of the protocol to clarify how timeouts are measured. Updated protocol to include handshakes in offline mode and to specify more precisely where timeouts occur. Clarification on the game outcome when multiple punters score equally. Clarification over the treatment of illegal moves by the server. Clarification over the maximum length of messages. Clarified meaning of disjoint union operator. We hope you’re getting on well with punting so far. We apologise for the initial issues with the web server being overloaded when the task was announced – we’d thought that the university servers would be able to take more punishment! We have now moved the website over to GitHub so this shouldn’t happen again. There have also been some teething problems with PuntFX, but we are working these out. These will not affect punters connecting directly to the test servers. We will take the servers offline in 15 minutes for maintenance; we expect downtime to be around 10 minutes. The task description is now available here. Good luck! The contest begins in two weeks time. Here is some preliminary information about the rules. Each participant must be a member of exactly one team. Teams may not divide or collaborate with one another once the contest has begun. There is no limit to the number of members of a single team. Contest participants retain ownership of all intellectual property rights in and to any submitted source codes, custom tools, and related materials (“Submissions”) that participants had before submission. As a condition of entry, participants grant the judges a non-exclusive, perpetual, irrevocable, worldwide, royalty-free license to use, reproduce, publish, distribute, publicly perform, and publicly display the Submissions for the purposes of allowing the judges to test and evaluate the Submissions for purposes of the contest. Welcome to the official website for the ICFP Programming Contest 2017, the 20th instance of the annual programming contest series sponsored by The ACM SIGPLAN International Conference on Functional Programming. This year’s contest is brought to you by LFCS at the University of Edinburgh. It will be held for 72 hours, starting from 4th August 2017 12:00 UTC and 7th August 2017 12:00 UTC. The task will be published on this website when the contest starts. Solutions must be submitted online before the contest ends. Details of the submission procedure will be announced along with the contest task. The contest is open to everyone except for contest organisers, their families, and members of their institutions. Neither advance registration nor entry fee is required. Any programming languages may be used as long as the submitted program can be run by the judges on a standard Linux environment with external network access disabled. The judging environment is a virtual machine running a recent version of Debian with a selection of programming languages installed. It is available as a Virtual Box image here. For further details take a look at the readme, which contains instructions and details the default languages and environments that are installed. Please let us know before the contest if you would like us to install anything else. There will be prizes for the first and second place teams, the team winning the (24 hour) lightning division, and a discretionary judges’ prize. The winners will be announced at ICFP 2017 in Oxford, UK, on Tuesday 5th September 2017.
join the IRC channel, #icfp-contest, on irc.freenode.net.